Jack Watson, Harry Avis and Freddie Phillips with coaches Chris Ineson, Steven Auty and Jack Sunderland. 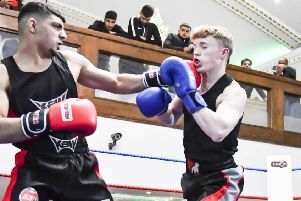 Harry Avis recorded a second successive win as the young boxer produced an impressive display at a show in Knottingley last Saturday. Avis, boxing out of the Training Cave Gym in Birstall, made his debut last month when he earned a unanimous points win at a show in Hull and he faced a much sterner test last Saturday. The 13-year-old came up against an impressive opponents and lost the opening round. Avis then showed that he could adapt and listen to instructions given from his corner to turn the bout. Avis went out for the next two rounds, boxed intelligently and took the win as he showed improvement from his debut bout and moved to 2-0. The Training Cave had two other boxers on the Knottingley show. Freddie Phillips competed in a skills bout and boxed very well against a fighter from a well respected club in Darlington. He showed great head movement and counter punching. The 12-year-old has had two skills fights now and coaches are looking to putting him into a proper fight in the near future. Jack Watson produced a determined performance but unfortunately came away with a loss. It was a tough fight for the 17-year-old’s debut as he came up against a boxer who had already competed a couple of times. There were no excuses from the Bistall camp as Watson’s opponent was better on the night and he will have learned a lot from this defeat and will only get better. Training Cave boxer Ben Sutherland made his debut on the Hull show on February 16 when he produced an impressive display and earned unanimous points win. The Training Cave is based at Carr Mills Business Centre, Bradford Road, under the guidance of former professional Jack Sunderland, with fellow coaches Chris Ineson and Steven Auty. They offer boxing sessions, aimed at children aged nine to 13 years old on Mondays, Wednesdays and Thursdays, between 5.30pm to 6.45pm, priced £3 per session or £8 per week, which includes three sessions.